Understanding a home’s true market value is about more than pictures, software assessments and price-per-square-foot. Whether you’re a current homeowner thinking of selling or are house-hunting, it’s crucial you understand what factors affect home valuation. By partnering with a local market expert, sellers will avoid pricing their house out of the market (the kiss of death in real estate) and buyers will ensure they get a good deal on their next home. 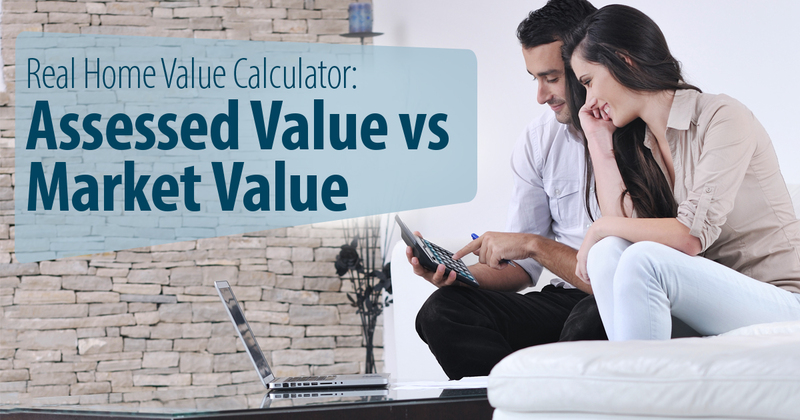 So, how do you accurately calculate a home’s value? After all, the value a home is assigned by its town or county and the one it’s given when it’s listed are often dramatically different from one another. Which one is accurate and what does it all mean? Read on to learn more. Assessed Value vs Market Value: What’s the difference? When it comes to home value, you’ll often hear two terms, assessed value and market value. ● What comparable/similar homes are selling for in your area. ● The value of recent improvements. ● Income from renting out a room or space on the property. ● How much it would cost to rebuild on the property. ● External characteristics, such as lot size, home style, the condition of the home and curb appeal. ● Internal characteristics, such as the number of rooms and their size, the type and condition of the heating or HVAC system, the quality and condition of construction, the flow of the home, etc. ● The sales price of comparable homes that have sold in your area. ● Supply and demand; that is, how many buyers and sellers are in the area. ● Location; that is, the quality and desirability of your neighborhood and other community amenities. What Determines a Home’s Value? Other factors that affect your home’s value include the function and appearance of the property, how well the home and other structures are maintained and whether the home is a lifestyle property, such as a ranch style with mountain views or beach bungalow. Ultimately, the best indication of a home’s value is the overall supply and demand of the market. This is why we recommend you partner with a real estate professional who takes all of these factors—the assessed value, local market conditions, home features and has physically walked through and experienced your home— into consideration to determine the most accurate market value. How to determine if a property is comparable to yours. Where can you find comparable sales? ● Your local assessor’s office is able to provide a list of recent sales you can browse and compare or a sales history of a particular house, home style or neighborhood. ● Your municipality. Many cities keep local sales information in their offices or post it online. ● Your local newspapers may offer some real estate information in the form of quarterly sales reports in the business or real estate sections of the newspaper. ● Our office. We regularly do Comparable Market Analysis of homes in our local area. How to calculate your home’s value. 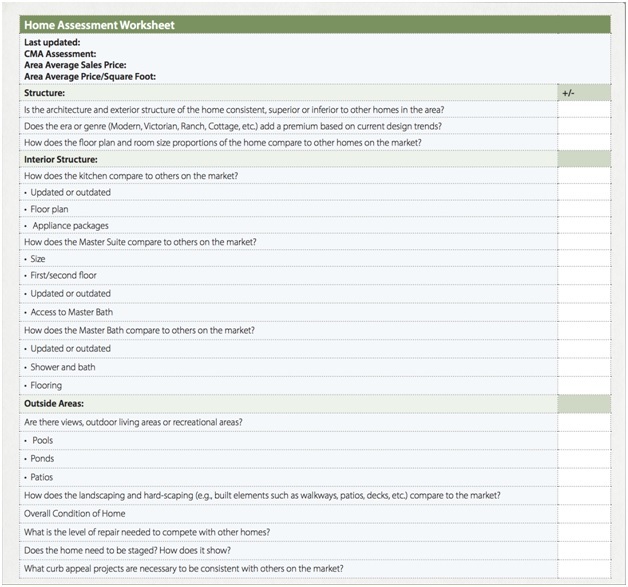 When was your home last assessed? What was its CMA assessment value? What is your area’s average sales price? What is your area’s average price/square foot? ● Is the architecture and exterior structure of the home consistent, superior or inferior to other homes in the area? ● Does the era or genre (Modern, Victorian, Ranch, Cottage, etc.) add a premium based on current design trends? ● How does the floor plan and room size proportions of the home compare to other homes on the market? ● How does the kitchen compare to others on the market? ● How does the Master Suite compare to others on the market? ● How does the Master Bath compare to others on the market? ● Are there views, outdoor living areas or recreational areas? ● What is the level of repair needed to compete with other homes? ● Does the home need to be staged? How does it show? ● What curb appeal projects are necessary to be consistent with others on the market? If you want to accurately assess a home’s value, it’s crucial to know about the market activity of our local area. We can help! Give us a call to get the scoop on the local market.